Green Party poster: what are you afraid of boys? 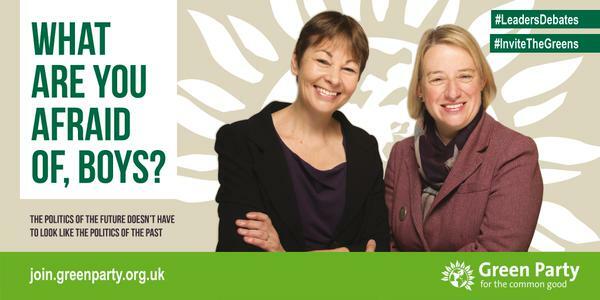 The Green Party have released a poster which challenges the other, male-led, political parties to allow them into the televised leaders debates. The Greens have seen a bounce in the polls since the issue around their lack of invitation to the TV debates was raised, so it’s unsurprising they’re trying to maintain momentum on the topic. The poster’s headline “what are you afraid of, boys” also highlights that the Green Party’s only MP is female and that the party is also led by a woman; celebrating this point of difference versus the competition will help them pick-up left wing anti-Westminster votes.